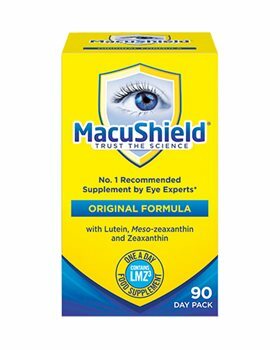 MacuShield Original Formula - with Lutein, Meso-zeaxanthin, and Zeaxanthin. *Reference: Original Formula and Original Formula Vegetarian - Survey of 92 UK Eye Experts 2017. LMZ³ in MacuShield Gold is made up of all three macular carotenoids: lutein, meso-zeaxanthin and zeaxanthin. Scientific research shows that these three macular carotenoids are found at the back of the eye, at the macula, where they form the macular pigment (yellow colour) and concentrated at the very centre of this pigment is meso-zeaxanthin. Bulking agent: Sunflower seed oil, capsule shell (gelling agent: bovine gelatin, humectant: glycerol, colour: red iron oxide E172), marigold extract (of which 15% is combined with lutein, meso-zeaxanthin & zeaxanthin, dl-alpha-tocopherol), thickener: beeswax yellow. Take one softgel capsule daily with a meal. The British TV show, Michael Mosley, Trust me I am a doctor tested the product and found that this, as the only one on the market, actually improves the pigmentation in the main part of your eye leading to an improvement of Blue/Yellow vision, Green/Red vision as also night vision. because of familial eye problems, and the concern that my husband and i need out eyesight to remain independent, my research for the best supplement to protect our vision, led me to Macushield. We have been taking it for some years now and we both pass our eye tests with flying colours. Recently i find i am more comfortable without my multi-focals, and although my prescription hasn't changed, i am able to read sub-texts on TV as well as viewing, but i still need glasses for reading and computer work. My cataracts have not progressed since i started taking MacuShield, and there is no talk of surgery. so i would recommend this as a very sensible protection for age related vision problems. I am very happy with this product, I feel I am doing the best I can for my eye health. It was recommended by a doctor on TV (Dr Mosley). The service I received when ordering it from Health Stuff was excellent, very prompt delivery. I highly recommend this company. Thank You. I have been using MacuShield for around a year now. I trust the science and hope that this will keep my eyes in good shape for the duration. I received my delivery sooner from across the pond than from suppliers here in the U.S. Thanks for the great service! I am very pleased with your price and prompt delivery of your Macushield price.